In the perennial debate over nature versus nurture, Steven Pinker has established himself as the pre-eminent contemporary spokesman for biology as destiny. Every few years, Pinker, a professor of psychology at Harvard University, publishes a doorstop-sized, improbably readable tome that swiftly generates controversy. Pinker’s thesis is that the human condition is, in effect, coded into the human genome. We have about two dozen basic cognitive and emotional systems operating between our ears. They are the product of evolution. Our capabilities as a species (for example, language) as well as our all too obvious limitations (say, the penchant for aggression) have eons of momentum behind them. Thus human nature, while somewhat flexible, is, for the most part, fixed. So it proves mildly surprising to consider the subtitle of Pinker’s new book. The very claim that violence has declined seems counterintuitive. After all, the 20th century obliged us to invent new terms such as “genocide” and “concentration camp”—while this one has been plenty bloody so far. 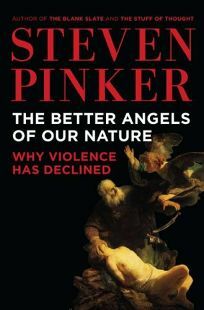 But rather than claiming that some homicidal imperative is hard-wired into us as organisms, Pinker maintains that we’ve grown less bloodthirsty over the course of recorded history. Through historical shortsightedness, we’re prone to underestimate just how pervasive routine violence was in previous eras. But Pinker’s graphs—and the evidence he harvests from anthropologists, historians, criminologists, and experts of many other kinds—suggest that the percentage of the population killed in warfare or everyday mayhem has declined, from century to century. The number of executions has gone down, and routine public displays of viciousness (such as torture and lynching) have grown less socially acceptable. By Pinker’s account, our evolutionary inheritance includes a tendency for dominance—as well as a knack for rationalizing violent actions as “provoked, justified, involuntary, or inconsequential.” But we also have capacities for self-control and empathy that become reinforced when societies undergo what the great sociologist Norbert Elias called “the civilizing process” of establishing a central, rational authority. Alas, that process has failed to pacify “the lower strata of the socioeconomic scale, and the inaccessible or inhospitable territories of the globe.” (The latter phrase evidently refers to the Third World, rather than Antarctica.) Better Angels is a fascinating and deeply irritating book—full of thought-provoking data, but also prone to bursts of dismissive sneering toward researchers whose work runs counter to Pinker’s current of thinking. He effectively reinvents Victorian notions of “the dangerous classes” and “lesser breeds without the law.” But his vision of “civilized” societies triumphing over humanity’s murderous impulses would be more credible if highly developed countries had not developed so many weapons capable of destroying all life on Earth several times over. Reviewed by Scott McLemee, who writes the weekly column Intellectual Affairs for Inside Higher Ed.